Stormwater management solutions vary based on climate change and various flood areas. Metropolitan Industries offers customized systems to provide solutions to the problems municipalities face following a heavy rain event. Aging infrastructures and budget restraints present municipalities with many challenges. Fortunately, there are cost-effective solutions available to prevent problems caused by stormwater by determining the origin of system failures and finding ways to prevent breakdowns in the future. 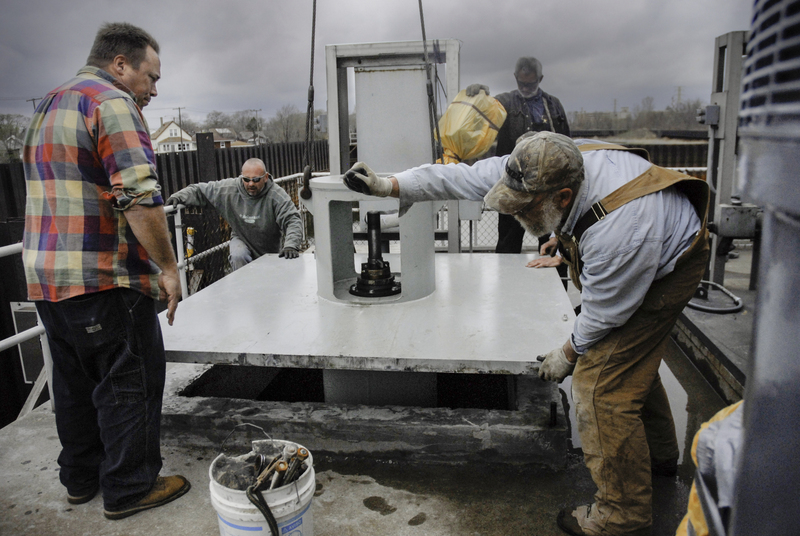 When one of four excess flow pumps began to run inefficiently due to a damaged impeller from wear and tear over the years, the City of Whiting, Indiana turned to Metropolitan to help solve the problem. The four pumps at that station have played a crucial role in preventing city flooding during heavy rainfall for the past 40 years. The aging infrastructure meant that it was only a matter of time before the other three pumps required repairs as well. Initially, Metropolitan supplied a brand new pump for the station so that the other pumps could be removed sequentially without sacrificing capacity in case a heavy rain event were to occur during the rebuilding process. It was imperative for each pump to be repaired or replaced in a seamless manner. After removing and inspecting the first 40 foot pump, the first unit was replaced and it was found that the remaining units were repairable. The second unit was successfully rebuilt and re-installed, while the third unit was removed. Eventually, all four pumps will be repaired with new components to extend their life. During a storm event, when the rainfall exceeds the operating capacity (3 million gallons per day) of the raw pumps, the treatment plant closes its influent sewer gate. The excess flow pumps are designed to divert the excess water into the retention pond near the plant where the water is stored until it can be evenly paced back to the treatment plant following a heavy rain event. Each pump stretches 40 feet long, with a 36” diameter discharge and produces 32,000 GPM. In less than two months, two of the four pumps have been repaired at Metropolitan’s shop. A grant from the Hurricane Ike Recovery Fund was awarded to the Village of Riverdale in Cook County, Ill. This gave the village the opportunity to restructure a crucial stormwater lift station that was in desperate need of an upgrade. In collaboration with Gaskill Walton Construction Company in Chicago Heights, Ill., Metropolitan designed a solution to improve the existing pump station. The 84” sewer pipe comes into the lift station parallel to the deep tunnel and pumps the water to the river. The upgrades also included two 42” diameter discharge flap gates and a stainless steel bar screen. Inside the existing building are upgrades to the control equipment and two new variable speed pumps running at 30,000 GPM with space for a third. The motor control center (MCC) includes VFDs for large motors at 125 HP, a 350 KW diesel generator and a PLC touch screen integrated into the existing SCADA system. To help save money the controls are run manually. The village will also use Metropolitan’s M2M cellular plan to improve communication efficiency at the pumping station. M2M cellular refers to technologies that allow both wireless and wired systems to communicate with each other over cellular, giving customers the most reliable data for the best value. The “M2M Ready” control panels include features like alarm notification, remote access, video surveillance and telemetry required for SCADA systems out of the box. All of the challenges associated with activating, troubleshooting, and maintaining M2M devices and accounts are eliminated. The video surveillance can be viewed remotely through a cellular modem. The lift station will qualify for rebate incentives from the Department of Commerce and Economic Opportunity (DCEO) for installing VFDs in the system. The system is an energy efficient operation and matches influent demands to save money. In conjunction with Robinson Engineering LTD of South Holland, Ill., Metropolitan Industries was assigned the important task of assisting in the renovation of a critical combined sewer overflow (CSO) pump stations in the South Suburban Chicagoland-area. The pump station, located in Calumet City, Ill., has been responsible for keeping many of the nearby south suburban municipalities from flooding during heavy rain events since it was originally built with Works Progress Administration (WPA) money in the 1930s. The nearby Metropolitan Water Reclamation District (MWRD) will close its influent sewer gate to prevent exceeding the capacity of the collection and treatment system due to the combination of normal sanitary flows and the excessive infiltration of stormwater. When this gate closes, the water accumulates at a rapid rate and begins to seek higher elevations, at which point, it begins to fill the wet well of the Calumet City CSO Pump Station. The station’s reliable operation during high capacity rain events is critical due to the negative consequences (of rising water) the surrounding municipalities would face if the stormwater is not conveyed to the Calumet River immediately. Four new submersible pumps were supplied, including the associated discharge tubes designed to house the pumps and convey the discharged water to the effluent trough that leads to the river. The city was provided with three 355 HP pumps and one 215 HP pump, which all discharge at a combined rate of approximately 155,000 GPM. One of the many unique aspects of this project is its great size. This is one of the larger submersible pumping stations in all of Chicagoland and one of the larger prefabricated buildings Metropolitan Industries has produced. 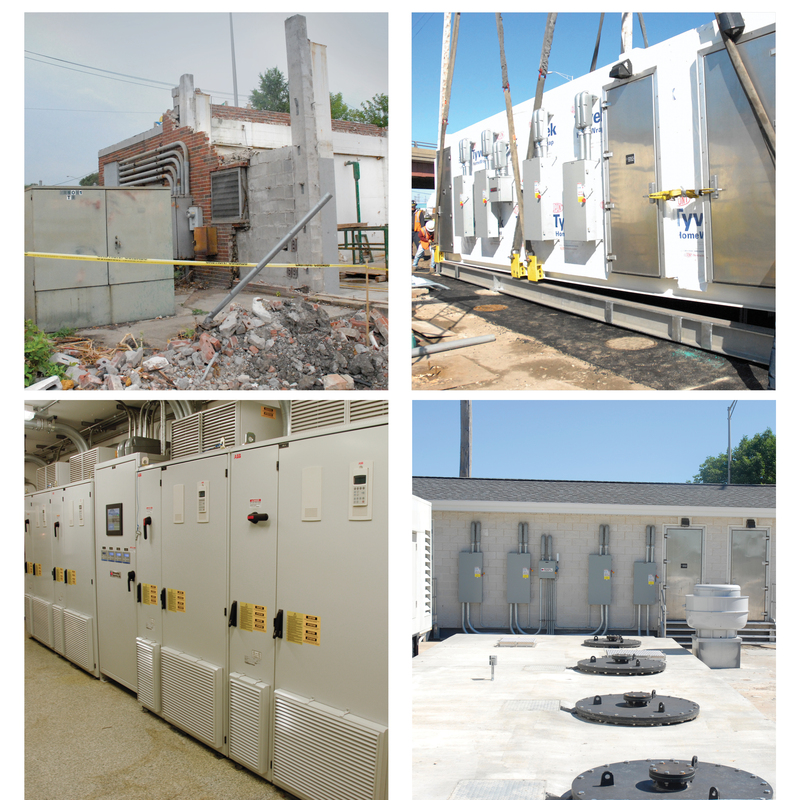 In addition to four new pumps, Metropolitan also supplied all of the power distribution equipment, controls and motor equipment related to the upgrade, including switch gear (to support existing standby generators) and SCADA equipment, all housed in a prefabricated building. The building houses low harmonic variable frequency drives, which accelerate or decelerate pump motors to match the influent rate. Regardless of the rainfall event or its severity, the pumps will speed up or slow down to match the influent rate to remove the combined sewer flows in an energy-efficient manner. The city’s need of an extensive upgrade of this pump station can be attributed to a number of factors, including corroded power distribution equipment due to hazardous sewer gases accumulating in the 1930’s building and pumping equipment last updated in the 1980s. Once the new building was complete, the existing building was demolished and the new building was set in its place. Following delivery of the building, the project contractor, John Burns Construction of Orland Park, Ill., added a gabled roof and an aesthetic finish to the structure used to match other Calumet City municipal buildings. Top Left: Part of the original combined sewer overflow pump station remained during the construction of the new building. Top Right: The new building during the installation process. Bottom Left: A view inside the new control building shows all new control equipment related to the upgrade. Bottom Right: The prefabricated building’s exterior matches other existing pump stations in Calumet City.